The other afternoon, as dinner loomed closer, I was drawing a blank as to what to make. My meal planning has fallen to the wayside as of late and the kids were getting hungry, not to mention their mom. So I decided to ask them what they wanted for dinner. The enthusiastic response was, “Chocolate chip waffles!” So I thought, why not? I have all the ingredients and it was a pretty simple recipe. Breakfast for dinner it was! 1. Combine the flour, sugar, baking powder and salt. Mix. 2. Add the milk, oil and eggs. 3. Then whisk it well. 4. Add the mashed banana. I usually squeeze the banana while it’s in the skin and then put it in the bowl. Use a spatula or wooden spoon to make sure it gets combined well with the batter. 5. And then the kids’ favorite part, the chocolate chips. Here’s their reaction when I told them it was time to add the chocolate! 6. 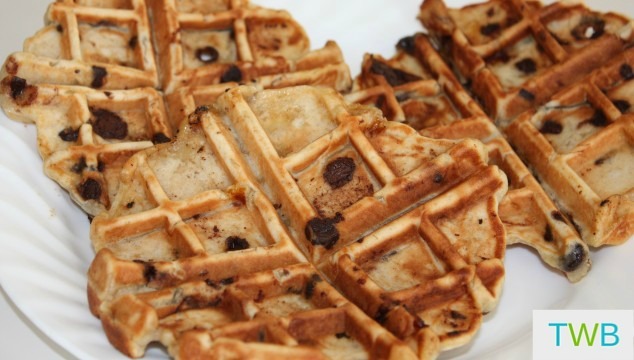 Let the batter sit for 5-10 minutes while the waffle iron heats up. 7. When the iron is ready, add about three spoonfuls of batter and then let it cook. Don’t check on it. The recipe usually yields about 5-6 waffles. You can always double it if you want more. To round out our breakfast for dinner, we added some scrambled eggs and watermelon. And the kids definitely enjoyed it! What’s your go-to meal when you don’t know what to make for dinner? Looks delicious Salma! Kids looked like they really enjoyed it! Thanks Candace, they were good! Hope your girls are doing well. We love having breakfast for dinner! I need to try this out. Gotta get myself a waffle maker first! Thanks for sharing. Recipe sounds yummy. Thanks! Breakfast for dinner is not only yummy but fast when you’re in a pinch. We were lucky and got a waffle maker from our in-laws because they never used it! And it can become a little addictive lol. Hopefully you can get your hands on one and try it out. I love chocolate waffles for breakfast. But never eaten them with Banana. I should try this the next round. I was happy to link up Nadia! The bananas are a really great addition to the waffles. They give some natural sweetness and make us feel like we are giving our kids something really healthy because we put fruit in it!